Few islands in the world offer the diversity that exists in Sri Lanka, from ancient cities, to rich religious festivals, colonial memories, rolling tea plantations, an astonishing variety of flavours, great beaches in the Indian ocean, and a bustling way of life. 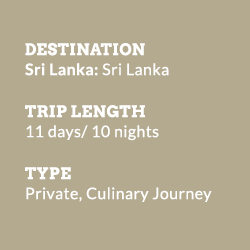 Experience the best of Sri Lanka, with private cooking classes from renowned chefs, whilst visiting the most spectacular sites and staying in beautiful boutique hotels. Ceylon Tea Sri Lanka is home to the best tea in the world and is one of the largest exporters. Learn about the great tea industry, meet planters in their homes, walk through lush green manicured tea fields, un-derstand and learn the ancient art of making tea, take an old tea train through the mountains…. 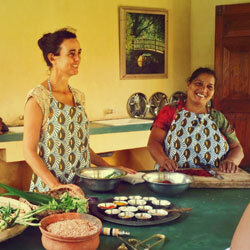 Food Due to the strategic position on the route between East and West, many cultures have influenced Sri Lanka’s cuisine. Neighbours, traders and colonisers have all influenced on the island’s food, creat-ing a mouthwatering blend of Dutch, Portuguese, English, Arab, Malay and Indian flavours. Mak-ing liberal use of local fruit, coconut, seafood and an abundance of spices, Sri Lankan cooking de-livers plenty of incredible dishes, from delicious curries, Parippu, Hoppers to the unique wood ap-ple. Our hotels during your journey are carefully picked for their outstanding quality, ambience and unique expressions of the region. They are sublime retreats, ancient manor homes, tea estates and often count as national heritage houses. The Wallawwa: Built over 200 years ago in a traditional Dutch colonial design, The Wallawwa is the most ancient manor house in the province and was the ancestral home for many years of the Dias-Abeysinghe family. Vil Uyana: The work of the Royal Society for the Protection of Birds and Wetland Trust in the UK was unusually the source of inspiration for stunning Vil Uyana. A wild refuge for otters, crocodiles and dragonflies, and refuge for the ultimate chill out, but without sacrificing creature comforts. Kandy House: A 200 –year old aristocratic palazzo gone 21st-century, it blends minimalist lines, atypical antiques and quirky strokes of colour around a central courtyard and fine romantic individ-ually designed rooms, named after indigenous butterflies. Tea Trails: Trees punctuate the vista, majestically rising above tea plantations and shimmering lakes. Tea Trails comprises of four classic colonial bungalows built in the days of the Raj. Each bungalow is quintessentially luxurious and colonial; a stroll back in time but entirely resplendent in modern amenities. Kahanda Kanda is a stylish private villa is perched on a ridge overlooking Koggala Lake and sur-rounded by 12 acres of a working pea-green tea estate and verdant jungle. Indulgent, spacious and contemporary, KK is made up of free-standing pavilions with individual suites, open- sided dining pavilions beside pretty lily strewn ponds and a beautiful infinity swimming pool. Tintagel: Situated in the heart of Colombo this stunning heritage hotel is of great national im-portance since it used to be home to the country’s most famous ruling family, the Bandaranaikes. Daring and dramatic, this chic boutique hotel offers the most discerning guests a stylish, elegant and very private city retreat. Dates are available year-round upon request. We recommend avoiding major holidays such as Christmas 7 New Year when the island is very busy and rates are high. Sinhalese New Year (Aluth Avurudda), falls on the 13/14 April each year. Many places such as tea factories are closed for several days so please take this in consider-ation when planning a trip. Climate Sri Lanka’s climate is quite complicated for such a small country due to the two monsoons. How-ever, there is good weather and nice temperatures somewhere on the island, at most times of year. We will design your itinerary accordingly to accommodate your preferred dates. Sri Lanka is generally warm and sunny throughout the year. Temperatures average between 27 – 30 C in Colombo and on the coasts and peak in April. They average about 10C cooler in the hill country. Sri Lanka lies 400 miles north of the equator and is affected by two South-East Asian monsoons. The south-west monsoon (Yala) brings most rain to Colombo and the South and West Coasts in May/ June and the inter-monsoon affects October/ early November although at all times of year sunshine can be plentiful and most of the rain falls in heavy bursts at night. The North-East monsoon (Maha) affects the North and East between December and February. Rainfall is becoming increasingly unpredictable. The North and East are drier, while the western slopes of the central highlands are the wettest. From US$ 4,600 pp, depending on season and hotel category. Please enquire for actual quotation. Optional extensions: Please enquire about extensions to explore more of the cultural sights or the amazing beaches of the island.